There are several ways to interpret it when a discussion about Patty Jenkins' Wonder Woman begins with something like: "Finally." Perhaps it references the legion of fans of the character, created in the ‘40s as a way of empowering girls and emphasizing the strengths of nurturing leadership, who finally get to see their heroine on the big screen. Perhaps the folks at DC have finally hit the right marks following a string of lackluster outings featuring the Man of Steel and the Caped Crusader. Or, perhaps we've finally been bequeathed that mythical female-led superhero blockbuster that so many have hope for over the nearly two decades comprising this latest renaissance of comic-book films, whether we're talking about the embattled actress filling the suit or the director at the helm. With Gal Gadot shouldering the burden like a perfectly-sculpted champ, Wonder Woman defies the expectations laid out by DC's output to date, lassoing together both optimistic and ominous tones into just the right kind of dynamic, vibrant projection of heroic idealism that this universe so desperately needed. Imperfect, but wonderful. This was mentioned in my review of Batman v. Superman: Dawn of Justice, but it bears repeating: remember when the internet flew into a rage at the casting of Gadot as Wonder Woman, and she ended up being one of few bright, indisputable aspects in what's otherwise a polarizing film? That glimmer of an appearance was enough to anticipate her own standalone story, especially once that'd properly trace her origins, even if we've been overdosed on "Fill-in-the-blank Begins" style of movies over the years. This time, it's deserved, as there's a compelling and fantastical story behind the creation of Diana. Traveling back nearly a century to the period of WWI, Wonder Woman reveals how the heroine was created under the watchful eyes of Grecian gods, how she trained to become a powerful Amazonian warrior initially against the wishes of her mother, Hippolyta (Connie Nielsen), and how the warfare of the outside world crashes into the Amazons' hidden island sanctuary … as well as how Steve Trevor (Chris Pine), a pilot who accidentally drops into their homeland, guides Diana toward battle in search of Ares, the God of War. Wonder Woman distills elements from the breadth of the character's history -- mostly subtle tweaks to the same concept at the various stages of the comics' ages -- in creation of this Diana's backstory, hinged on her immortal and peaceful existence in the transparent island of Themyscira. Against the sparkling blue ocean and lush foliage, the film's visual language immediately focuses on effervescence and breathability, almost alien concepts in DC's bleak atmosphere. Starting from square one in shaping her mythological character amid these surroundings, Diana grows up from a young, spunky girl who actively wants to learn the ways of being a warrior to a statuesque woman with a strategically concealed destiny, mirroring other action-oriented epics in its formation of her background. Her progression might follow along that well-worn path of vigorous training, discovering one's predestined importance, and tragedy propelling the character's drive and confidence, but the Amazonian culture of stewardship created by Patty Jenkins gives old concepts a fresh, compelling attitude. From the moment Diana can be seen testing her mettle while training against other Amazonian women -- long before she slips on the iconic outfit for the first time -- Gal Gadot hammers home that she's ideal for this role, displaying both the physicality and poise for the girl who's to become Wonder Woman. Gadot's capability to handle the rigors of battle is only part of the equation, though, one already proven she can handle in Batman v. Superman, yet continues to do so amid the sword-wielding and gymnastics involved with the character's time on Themyscira. It's in the quieter moments after her training and battle that Gadot embraces the substantial other side of embodying the character, someone driven by rational idealism in how she approaches the outside world, the concept of warfare, and her determination to travel beyond her home island. With striking beauty counterbalanced by the power of her confidence and resolve, Gadot musters a specific kind of electricity within her desire to seek out her people's foe within the war-torn world of mankind, revealed in both delicate responses and energized outbursts. 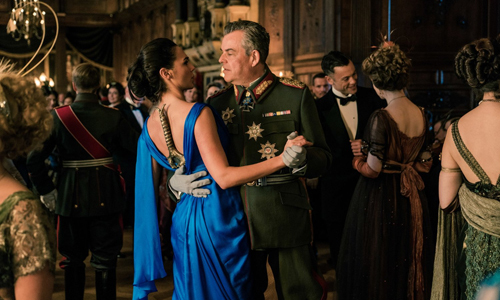 Wonder Woman switches between two fish-outta-water stories, beginning with Steve Trevor's time with the Amazons and then, more importantly, leading to Diana's journey into the bleak, industrialized atmosphere of WWI-era London and Europe. The playfulness between them is magnetic, where Diana's perceptive innocence and Steve's harmless male bravado light up the screen through the chemistry between Gadot and Chris Pine. It's good that they do, because the sequences that bridge the gaps between Themyscira and the trenches of battle dramatically slow down the pacing, propelled by cliche happenings featuring clothes being tried on by the Amazon woman and human food being tasted for the first time. Gadot's charisma and the way she interacts with Pine's appealing performance as Trevor -- a character whose balance between chauvinism, awkwardness, and likability isn't easy to get right -- enlivens this otherwise lethargic stretch in the film, boosted by director Jenkins' sincere, endearing perspective on Diana's outlook on how the outside world should work. 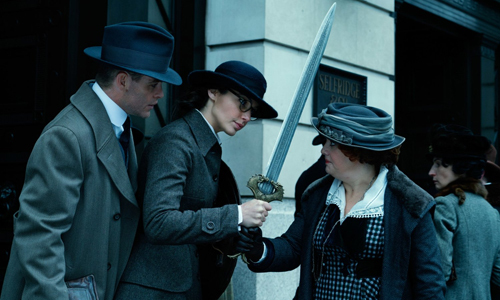 Once Wonder Woman storms onto the battlefield, the action telegraphed by Patty Jenkins is a marvel to behold, juxtaposing the evils of Germany during World War I with the superhuman powers that make Diana such an inspiring force. The stakes can be challenging to uphold when mortal weapons are being used against a godlike warrior who can deflect bullets and rapidly snare her foes with a golden lasso, but director Jenkins telegraphs them with gritty, steadfast momentum that persistently grasps at the heart of the matter, paying close attention to how her might pushes forward against overwhelming odds and inspires those around her. Jenkins remains playful by concealing Wonder Woman's classic outfit for an impressive stretch of time, and the way she eventually storms onto the hopeless, decimated expanses of No Man's Land in all her classically-dressed glory amounts to a monumental payoff. A symphony of digital effects and slow-motion photography elevates the magic bringing her immense powers to the big screen, and it's damn invigorating to see her skillfully debilitate her foes. 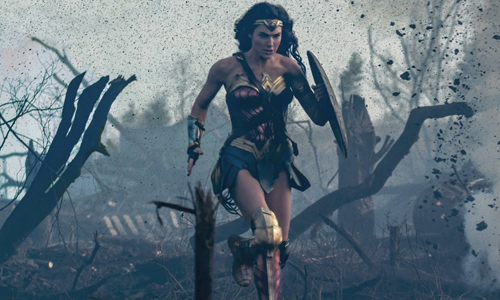 Director Patty Jenkins never loses sight of the reasoning behind Diana's journey to the world of man, though, and the conflicts that emerge in her search for the literal God of War while surrounded by figurative displays of said god's desires transform into Wonder Woman's crucial strengths. When it eventually delivers on its fantasy-action promises -- following zany plot twists involving Grecian mythology and evolving stages of weaponized gas, as well as other moving parts befitting the genre's formula -- it does so while also tying into its heartfelt musings about humanity's violent nature and the origins of Wonder Woman's emergence as one of their heroes. How the final act ultimately challenges Diana's powers could be called overblown, something typical for superhero films (especially those from DC), but the moral complexity involved about warfare and the flaws of the men whom Diana fights alongside give the chaotic showdown a jolt of relevant depth and immediacy. Finally, DC have discovered how to properly channel optimism through bleak circumstances and blockbuster vigor, and they've done so with a remarkable and iconic heroine leading the charge in what'll stand tall as one of the year's best superhero films.